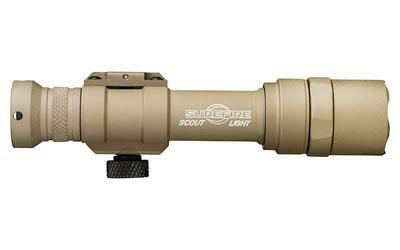 The M600U Scout Light is a lightweight WeaponLight featuring an ultra-high-output LED that delivers 1000 lumens of blinding white light. A proprietary TIR lens shapes the recoil-proof LED’s light into a beam with plenty of reach but enough surround light to accommodate peripheral vision, making the M600U ideal for medium to longer-range applications. The rugged M600U attaches quickly and securely to any MIL-STD-1913 rail via its integral thumbscrew clamp. The light is activated by either clicking its pushbutton tailcap switch or by pressing the pressure-activated tape switch on select models. Constructed of lightweight aerospace aluminum, Mil-Spec Hard Anodized finish, and O-ring sealed to keep out the elements, the tough M600U will endure combat-like conditions without any sacrifice in weapon maneuverability.